“Tell me your heart’s desire,” her voice whispered to me in the silence. 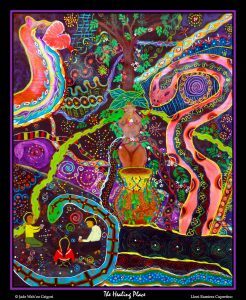 As the first waves that would soon carry me into the Ayahuasca Light vibrated through me, the presence of Mama Ayahuasca modulated those frequencies into discernible speech. “I choose bringing the systems of my body into balance so that my health is radiantly vibrant,” I responded. With this statement of intent expressed, the Waves of Light carried me into the radiant stream of Awareness. In the mythic perceptions that accompanied the movement, I was in a dugout canoe, paddling up a river that twined in the midst of a deep, velvety and verdant jungle. Pink Amazonian river dolphins swum ahead of me, occasionally surfacing, leaping, playing, guiding my journey. While these visionary experiences were unfolding in Awareness, I lay outstretched upon the floor of our maloca, the stilt-raised platform with thatch roof and screened in sides that served as our home and ceremonial room for the Ayahuasca ceremonies I, and my group of fellow sojourners, were participating in. On the edge of a Shipibo tribal village, set alongside a lagoon adjacent to the river, canopied by the dense jungle of the Amazon basin, the maloca kept us protected from rain, mosquitoes and other creepy-crawlies of the night. The degree to which the maloca provided us with a containment of protection in the spiritual realms was soon to become evident, as well. The Elder Shipibo shaman who was our Ayahuascero, Maximo, sat upon a mat of woven reeds. Arrayed about him were the items of his status: a lit candle; agua de florida, a flower infused alcohol used for spiritual cleansing; his hand-carved wooden pipe complete with monkey bone stem, and the richly black and potent tobacco native to the Amazon, mapacho, that he would smoke from the pipe; a two-liter bottle of Ayahuasca, the brew comprised of a liana vine and chacruna, the leaves of a jungle bush, that had been boiled together for hours on end in order to bring forth the sacred beverage that, when drunk, would release the barriers that separate Mind from Soul and enable one’s Spirit to move with fluid awareness in the realms that are found to inhabit the interstices therein. With the dissolution of boundaried perceptions awareness of multi-dimensional dynamic interplays becomes evident to the senses. The pink river dolphins part into two groups as an island appears mid-stream in front of me, one group swimming left around the island, the other to the right. I paddle the dugout directly forward, for there, upon the shore, is a woman beckoning me to land. She is dressed in typical Shipiba wear: a blue satin blouse with ruffles of red and yellow midsection, a skirt wrap of hand woven cotton, dyed black with a local clay, embroideries of many colors depicting a map of the cosmological realms of the Soul in which I find myself. Her raven black hair is worn loose and long, her bangs cut straight and short. Beaching the canoe I step forth to ground and walk towards her. She takes a step towards me and grasps my hands in hers, then guides me to my right, still holding my hands in a gesture of welcome and comfort. By her carriage and presence – or is it by direct transmission of knowledge? – she makes it known to me that this is The Healing Place and that she is the Woman of Healing. We walk a bit more or less along the shore and then back a bit into the bush. There a man, the Man of Healing, awaits us. He is attired in a long smock type gown. It is of white handspun cotton, with geometric patterns of black imprinted upon it. He is sitting upon the ground on a mat of woven reeds. About him are placed a few implements, clearly of a ceremonial nature. He indicates that I should sit in front of him. I do so. In this moment I hear Maximo call to me, “Jade! Jade! Ven. Ven. (Come. Come.)”. Deep in the altered state and accompanying physical torpor of the Ayahuasca journey I crawl on hands and knees the few feet to where Maximo is sitting. I manage to sit, my lower legs tucked beneath me, allowing me to bend forward freely. Maximo blows smoke from his pipe over me three times. He then begins to sing the icaros (Ayahuasca songs) of healing. For a full half hour he sings. At the end of this time he draws my head to his, then swigs from the bottle of agua de florida and sprays it over my head and open palms. Maximo affectionately pats me on the head, laughs. I thank him and return to my bedding pad. All the while, in the very same moment of time… I am present before the Man and Woman of Healing on the island in The Place of Healing! The Woman of Healing stands beside the seated Man of Healing. The man begins to puff up a large cloud of tobacco smoke from his pipe, then leans over me and blows it above my head. It is clear that he is closely observing whatever it is that the patterns forming in the smoke reveal. Wordlessly still, he gently pushes upon my head, directing it to the ground, and grasps my feet, stretching them so that I lay prone upon the ground in front of him. Continuing to blow billowing clouds of smoke upon and about me, he observes, then takes action. He scoops a shallow basin in the soil between us, into which water is poured. In that fluidity between moments of time and the non-spatial intersections of place I am aware of all that is transpiring as simultaneous non-local events of great synchronicity. Outside our maloca I see, in the pale moonlight, activity. I know, with a certainty, however, that there are no people outside, as everyone is laid out on their sleeping mats, deep in their own Ayahuasca journey. Through the screening I can make out two shapes. They appear to me to be large winged insectoids of an organic mechanical nature. The male is about 6 feet tall, the female about 5 feet tall. Each has both a tail stinger, without a barb, and a proboscis, the male’s being longer and more pronounced. I notice, as well, that one of our group members, Troy, half sits and looks out the screened wall to the exact same location. It is clear that he is seeing something outside as well. In the same merged and transcendent experience of mutually overlapped realities, I am sitting upon the ground in front of the Man of Healing, and a short moment later Maximo, as already described, calls out to me to come sit before him. As Maximo, in the 3D world, is singing his icaros over me, so upon the island is the Man of Healing laying me down and beginning to do his healing work upon me. The activity of one shaman does not predicate the experience of the other; rather they are simultaneously occurring events happening in different realities. I see, in vivid recall, a moment in time in the early 1980’s when I was asleep on the couch in the apartment of my friends in Southern California. These same two organic metallic insectoids are standing over me. Totally devoid of emotion, and therefore bereft of soul, the female pierces my etheric belly with her stinger, then deposits an egg into the hole thusly made. Immediately the make pierces the same spot with his stinger, the point of the stinger piercing, as well, the shell of the egg the female has deposited within me. Through that breach of the egg shell the male inseminates the egg. From that moment forth these insectoid beings have been in the shadows at the perimeters of my consciousness. Never seen, only sensed, sometimes glimpsed as a shadow moving across my field of vision, they have waited for the hatching of their spawn. The male, however, would on occasion insert his proboscis into my belly, as if to check on the condition of its child growing inside my etheric body. When the male would draw the fluid of the spawn up his proboscis, in order to analyze its condition, he would also draw upon my own life force, and specifically he would drink of my emotions. This insectoid being, lacking any emotional capacity itself, would stagger drunkenly from the emotions he had imbibed. Indeed, it became quite clear that he had become addicted to the emotional essence he was sucking from me! The Man of Healing made an incision into my belly, reached his hands in and withdrew an ovoid object. Brilliant fireworks of golden light arced up from the object. I recall thinking “Oh! How so very beautiful it is!” However, the farther the Man of Healing withdrew the object, the fewer sparkles of golden light did it emit. Indeed, by the time he had fully withdrawn the object it was grey and without its own light. It was then that I realized, aghast, that the light being emitted was my own life force, that the object (the larva implanted in my belly all those years ago) had been feeding off of my life force! Once he had withdrawn the larva completely from my belly, the Man of Healing placed it in the basin of water. I asked the man of Healing why he had placed it in the basin of water. He explained that the water would disintegrate the larva’s outer encasement, allowing the Ayahuasca Light to penetrate the larval form and kill it. With saying that the Man of Healing placed his hands over the larva and transmitted an intense beam of light into the submerged form, and the larva melted into a gelatinous blob, no longer alive nor a threat to me. The two parental insectoid beings, in that instant, turned away from the maloca, spread their metallic wings and flew off, through a portal and back to their home world. I noticed that these beings that are devoid of emotion showed absolutely no signs of sadness nor remorse at the death of their spawn. It died, their presence was no longer functional, they left. Done. Gone. The Woman of Healing spoke. She told me of how the presence of this parasitic larval entity had affected me. She told of how it had been sucking upon my life force and would primarily derive that force from the food I would eat. As I was getting only a pittance of vital force from the food I was eating, she described how I was, in essence, being vitality-starved. 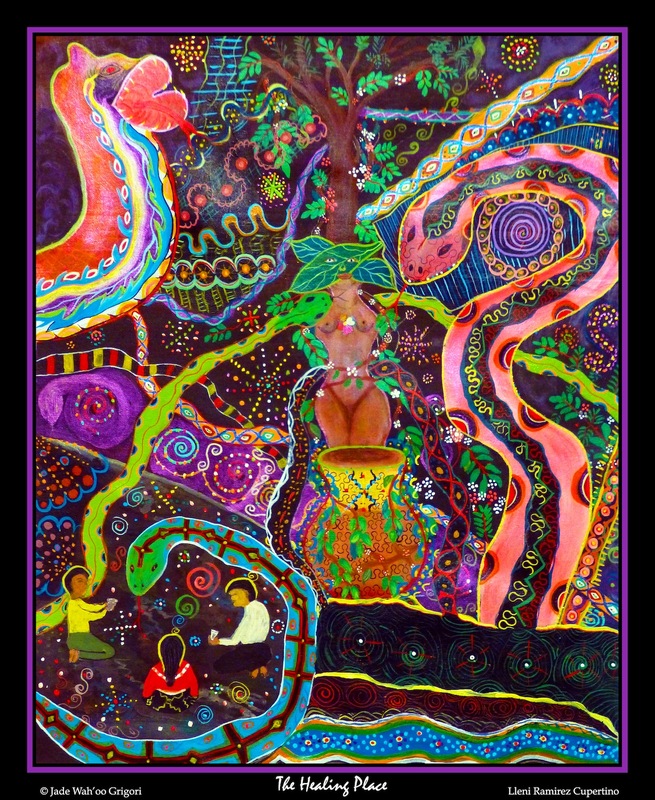 The waves of Ayahuasca’s light coursing through me began to subside. Pulsing non-sexual full body cosmic orgasmic shudders gave way to gentle trills rippling through my body. I opened my eyes into the quiet velvety darkness of the maloca. My fellow sojourners began to rustle. We whispered greeting to each other. Giggles spontaneously broke out. Looking through the screening of the maloca’s sides, I could see the Moon, stars, shimmers of remaining Ayahuasca light beckoning me. I rose, went outside and greeted life with a deep sigh in gratitude of a journey well accomplished.